Ty Fuller, P.G., Chairman of the Long Island Water Conference addressed a full house of NSWCA water commissioners on pressing issues of the day. Mr. Fuller who is also Director of Strategic Initiatives and Lead Hydrogeologist for the Suffolk County Water Authority (Oakdale, NY), covered pressing issues in his presentation to the assembled commissioners. 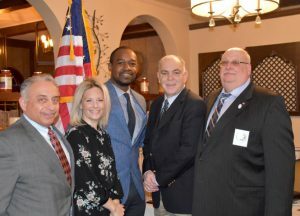 He commented that greater funding from New York State is essential to rectifying the current state of affairs, citing that a portion of the presently allocated $2.5 Billion dollars is earmarked for sewer remediation as opposed to the issues about drinking water. He further noted that funding consideration, including the potential piercing of the mandated tax cap, must be governed by individual district needs, not arbitrary numbers.